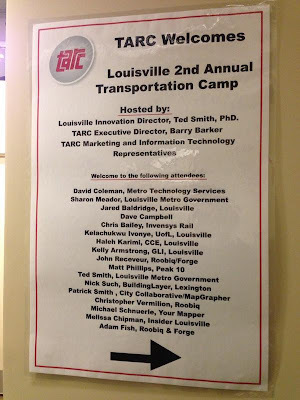 Last night was the 2nd annual Louisville Transportation Camp, and the event was another huge success! Over 40 people where there, including Ted Smith, Barry Barker, and representatives from different TARC and city departments, including Metro Technology, were there and provided insights and took feedback. Also there were local entrepreneurs from Mavizon, Awesome Inc, Insider Louisville, Peak 10, Taco Punk, Forge, Building Layer, MapGrapher, and Roobiq. After a tour of TARC's Gold LEED Certified building (the only government building to be certified as such in the nation, according to TARC), Ted Smith had some opening remarks, I gave a quick recap from last year's camp and talked about open data and the Your Mapper API, and Barry Barker discussed current initiatives and challenges at TARC, including getting a grant for all electric buses next year, RFID smart payment cards, route optimization, dedicated bus lanes, and budget constraints. Last year TARC opened its GTFS feed to Google and the public, allowing transit directions in all of Google's Map applications, and devs to build tools using the data. While I'm not aware of Louisville developers that have used the data, there are lots of national services that have picked it up and ran with it, like HopStop, City Maps, and Transit App, and eventually Apple and Bing Maps. 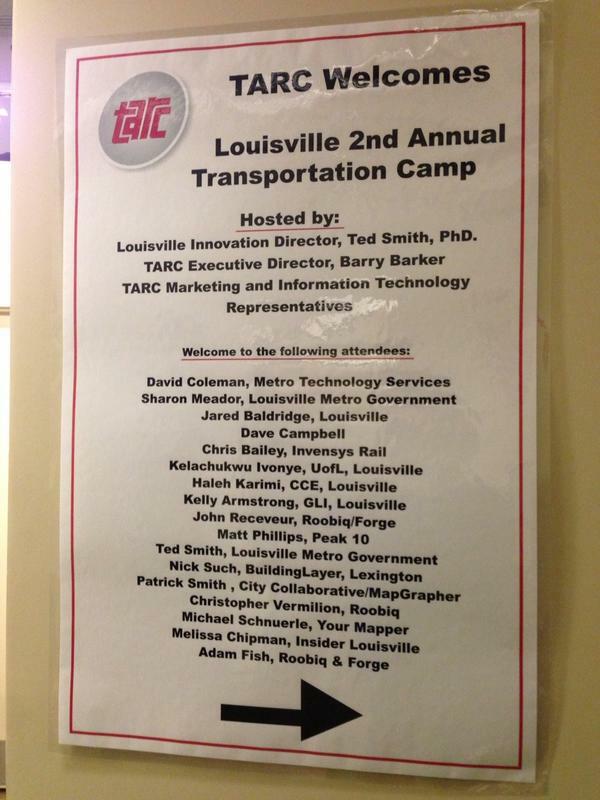 Anyone in Louisville can leverage TARC transit directions within these apps. City Go Round has another Louisville app list. Finally we moved on to discussing the state of real-time GPS from the busses. Currently, TARC is using third party software to allow them to manage their bus locations, called Trapeze. Unfortunately, while this allows them to know the location of all 200+ busses via GPS at the TARC headquarters, the software does not allow export of this live data, for use in the real-time public feed. TARC is pressuring Trapeze to upgrade their software to allow this. By December, it is expected to be available on TARC's site on their Trip Planner (powered by Trapeze). Green Bay Metro already uses this, if you want to see it in action now. Then by March there should be another update that allows the data to be sent to the GTFS Realtime data feed, allowing real-time bus locations to be known by the public and Google. This will make bus arrival times more accurate in apps and services, and allow animated maps to be creating showing all the city busses locations at once. In the meantime, Mavizon offered to place their devices on any number of busses, I offered to make a web interface to visualize their locations on a map, and Peak 10 offered to host the servers, all for at no cost to TARC. So we'll see if this pilot program idea moves forward at TARC. Every TARC bus has multiple cameras installed, recording events locally. But transmitting these images to the public is not feasible since they are encrypted by the vendor for security, and are high-res enough to cause bandwidth and cost issues even if they could be transmitted. So the solution is to install an additional lower res camera and transmit that in isolation. The goal would be to use software to detect the number of open seats and add this data to the real time apps. But I believe the cost for this outweighs the benefit for now. There are likely better solutions for counting passengers, using lasers, pressure plates in seats or exits, and other means. But these will require some hardware installation and software to transmit the data back in real-time. And I'm not sure that knowing how full a bus is will affect your decision to ride it very much. Though it would be neat to see a map of every bus with color-coded markers showing capacity across the city, and a clickable live image of the passengers. There also could be an app that could accomplish this through crowdsourcing. A kind of Waze for busses. Riders could report back on bus conditions, like capacity, noise, smells, mood, issues, etc. I'm not sure how to get usage of this however, unless it's incorporated into a custom app that provides transit directions (like the ones listed earlier) and other features to keep users engaged. But an idea worth pursuing for entrepreneurs. Having Wi-fi access for passengers would be a great perk for bus riders, especially long-ride commuters, who could use the time to occupy themselves on laptops, tablets, iPod touches, and dedicated gaming devices. One idea was to have some wireless hotspots that could be tested out on some busses to gauge demand. Another was to partner with Boingo or GoGo to install paid wifi for customers, much like airlines do - that way TARC is not out of pocket and in fact can generate revenue shares from these services. Like last year, there was a great energy and enthusiasm on the part of the public, local entrepreneurs, Metro Louisville, and TARC. The ideas were a bit more focused this year, and seem to be within reach. The next camp might be as early as March, when the real-time GPS feed is likely to launch. Thanks to everyone who attended and let's keep the momentum going! Thanks for pulling this event together, Michael! Excited to see more public/private group interaction like this. Kentucky's two biggest cities are on the move! I appreciate the notes about the last 2 meetings. I'm curious if you know of any local developers producing mobile TARC app.